There are a couple of foods that I eat every single day and yogurt is one of them. I love it and it's good for me too. Did you know that Yoplait Light and Yoplait Greek 100 now offer 20 Delicious Flavors for only 2 Weight Watchers® PointsPlus®value each. As the only yogurt endorsed by Weight Watchers®, Yoplait makes it easy to enjoy a delicious, creamy, and satisfying snack any time! 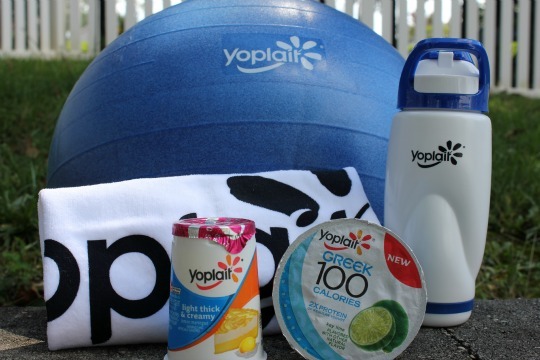 The nice people at My Blog Spark and Yoplait sent me this awesome prize pack that included a Yoga ball, water bottle, work-out towel, Yoplait Light VIP coupon and a Yoplait Greek 100 VIP coupon. Leave a comment on this post telling me which Yoplait flavor and variety you are most excited to try. ﻿Follow Yoplait and Me and My Pink Mixer on Facebook. Follow Yoplait and Me and My Pink Mixer on Twitter. Follow Me and My Pink Mixer on Pinterest. I love the red raspberry flavor. Thanks for the chance to enter. I would like to try the Greek 100 black cherry. I love Greek yogurt but haven't tried the Yoplait Greek yogurt yet. I am a pintrest follower of your too! :) - just barely signed up for you! I like Strawberry and an anxious to try the Greek style.